Photos above, L to R: Alice (Ali) Lee Lund; Alice Lund, 1962 high school graduation photo; Ali Lund (left) with her brother Wes and the late Vivian Moholt on the Moholts' 50th wedding anniversary. 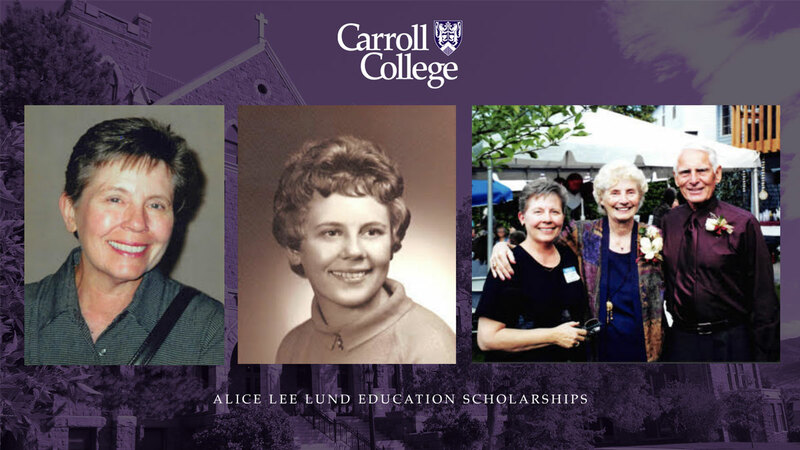 HELENA, MT – Carroll College is proud to announce a one-time gift of $100,000 from the Alice Lee Lund Charitable Trust which will provide $20,000 scholarships for five first-year students entering the teacher education program at Carroll College in the fall of 2019. All applicants for admission to Carroll’s education program will be considered for these need-based awards and recipients will be notified by early May. Awardees will receive $5,000 per year for four years as long as they continue to major, or double major, in education. The late Alice (Ali) Lee Lund was born in North Dakota in 1944 and raised on her family’s farm outside Williston. She earned a bachelor’s in education and a master’s degree in health and physical education at the University of Montana. After traveling with her husband, they adopted a daughter, Jessica, and settled in Ohio, where she taught school for many years. Ali then returned to Missoula, Montana, where she lived until she passed away from cancer in 2001. “She loved children and teaching and wanted to support others in this profession through her Trust,” said Wes Moholt, Ali’s brother and the manager of the Trust from the time of her death in 2001 until his retirement as a trustee in August 2013. Committed to maximizing opportunities to help children and teachers, as well as animals and those with cancer as Ali would have wanted, Wes sold the family’s North Dakota farm but retained the mineral resources. He negotiated profitable lease agreements, thus quadrupling the Trust’s assets and grant capacity. “The Trust’s capacity is as much a reflection of Ali’s initial contribution as it is of Wes’s astute management and dedication to his sister’s memory,” said Ron Nelson, shareholder in the Great Falls-based law firm Church, Harris, Johnson & Williams, the successor trustee to Wes. Wes continues to make site visits to organizations the Trust supports. Some of these have been memorable, such as the time Wes secured the record at age 88 as the oldest person to ride the zipline he funded at Camp Mak-A-Dream. For information on how to support student scholarships at Carroll College, please contact Cindy Everts, Major Gifts Officer, at ceverts@carroll.edu or (406) 447-4445.